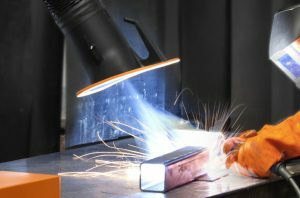 Greater awareness about the dangers of welding fumes is needed. Occupational safety is often still poor despite the high risk potential. In this interview, the trained welder Tim Formell describes his experiences as a welder – surely not the general rule, but still a terrible example on how companies gamble with the health of their employees. The 30 year old industrial mechanical for industrial technology and a certified technician in mechanical engineering has worked as a metalworker for a medium-sized engineering company for more than seven years. In addition to producing metalwork in the initial and final assembly, turning and milling, he was also tasked with welding. In his opinion, welding is inherently more dangerous. We regularly report here about legal requirements for occupational safety in welding. How have you experienced occupational safety? Not at all, in fact! Extraction for WIG welding was not available. In general, there was only an about 1 x 1 metre large skylight for workshop ventilation. The company did have a grinding cabin with extraction, but this was located on the other side of the workshop. Therefore, welding fumes were always run through the entire production area. That does not exactly sound like occupational safety at a high level. No, definitely not. Even the dividing walls between the welding stations were inadequate and partially they were just put together from cardboard. It was a frequent occurrence to be blinded while working, since the dividing walls were only about 1.6 m high and had many gaps due to the haphazard construction. Did you not have any protection at all? The protective equipment for welders included among other things a welding helmet with automatic shading and welding gloves made from leather. Only the welder himself got a leather protection jacket, but the helper did not. General protective clothing was each employees responsibility. Don’t you think that it is rather reprehensible to leave employees to fend for themselves in this way? Yes, definitely. Burns occur very frequently during welding – both due to hot components as well as due to intensive radiation. For example: If a colleague is working on a welding construction and you help him, then it may be that your eyes get dazzled or you burn your skin. This happens particularly quickly during WIG welding, if you do not wear suitable protective equipment. In addition to electrode welding processes for machines made from construction steel, WIG welding was our day-to-day business. And what about the hazards due to welding fumes themselves? This is naturally the other big danger. Frequently, you get so close to the action with the welding screen that the fumes get behind the screen. WIG welding does not create as much welding fumes as e.g. 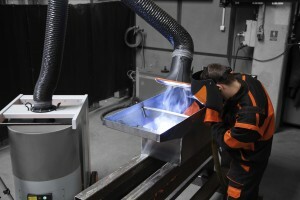 electrode welding, but the welding fume contains highly toxic substances. And in all those years nothing was done about it? In several years of working for the company nothing changed, despite several complaints. The message was always: The work has been done like this for decades and until now everything apparently had always been just fine. No, the welding itself or the work close to the welding workstation always gave me headaches. Irritation to the airways caused by welding fumes were naturally part and parcel of the job. Do you think that you may suffer long-term health problems? At the moment, I don’t have any symptoms, but long-term effects may show up years down the line. I certainly do not hope so, but you cannot be sure if you are a welder and work without sufficient occupational safety. 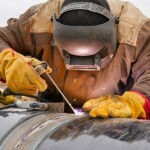 How do you experience occupational safety of fellow welders in other companies? I have some friends who work in companies where occupational safety is the top priority. They carry out regular training sessions on occupational safety and they have a safety officer you can contact to get more information or even suggest improvements. What would an exemplary company with regards to protection against welding risks such as welding fumes look like for you? Such a company would provide proper screens between the individual workstations in the welding section and ensure that every workstation has its own extraction. Can you see a trend that the sector is mostly heading into a different direction? In my opinion, that depends very much on the size of the business. In smaller companies, sufficient occupational safety does not take place as the costs are often too high and the employees do not show any signs of immediate exposure or illness. Those in charge quite often think that its not that bad. In large, corporate companies, there is often a union that supports the employees and will not tolerate inadequate conditions as it is often the case in smaller businesses. Damage to the company’s image in the event of potential legal action is also a consideration. Why should employers provide best possible occupational safety from your point of view as an employee? If an employee recognizes that everything possible is done to provide relief or protection, then this increases the mood significantly and you are able to identify with this company. Productivity increases due to this positive attitude. You can surely imagine what the mood is like when the protection only plays a minor role. 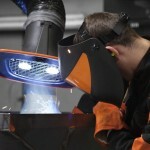 What is your perception: Are welders themselves even aware of the dangers behind welding fumes? Are welders sometimes to blame that they don’t protect themselves properly? 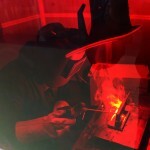 That often depends on the training, experience and expertise of the respective welder. Certainly, there are welders who are not properly informed or who simply don’t care. What do you recommend to job applicants so they can make sure that occupational safety is taken care of before they even start the job? Have a close look at the production site and pay attention to certain aspects such as extraction plants or properly divided welding stations. Personal conversations with future colleagues may also be of help insofar you have the opportunity as this will get you first hand information. Limit values for welding fumes: Let’s count the particles!